Colin Firth, Cate Blanchett , Patrick Stewart and a host of other stars have something to say about refugees. They have released a short film called #WordsMatter which explains the meaning behind the word “refugee”. 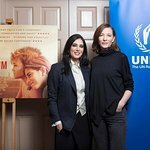 Goodwill Ambassadors and high profile supporters have come out to support UNHCR, the UN Refugee Agency, help define the difference between the terms “refugee” and “migrant” which are being splashed across media headlines because of the ongoing European Refugee Crisis. Craig Ferguson tells us “a refugee is running for their life” and Bollywood star John Abraham goes on to explain that “they often undertake traumatic and treacherous journeys”. Neil Gaiman tell us that “they are entitled to special protection under international law”. Stars featured in the video include Barbara Hendricks, Cate Blanchett, Colin Firth, Craig Ferguson, Douglas Booth, Helena Christensen, John Abraham, Kristin Davis, Neil Gaiman, Patrick Stewart, Peter Capaldi and Rokia Traore.